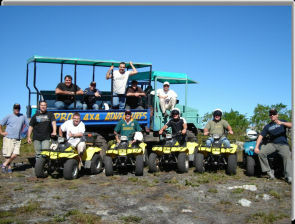 Experience nature as a team in a unique, healthy and thrilling way. See your co-workers loosen up, drop the masks. Orientation on the quads for all. Adventure sets the mind rolling for productive brainstorming. You can have an easy team building, or a mild one, or a combination, or you can try the ultimate team building challenge. 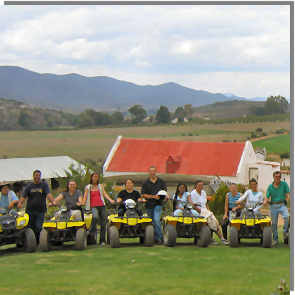 Travel to the top of the Langeberge with a quad and come down with the 4 x 4 or else, let the adventurous ones in your company go on the quads and keep the 4 x 4 to yourself. 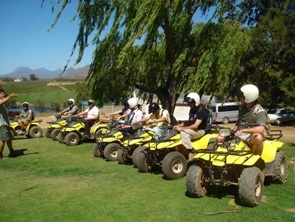 For groups or team building we offer the full day going up the Langeberg Mountain with the quads and the 4 x 4. Then the less Adventurous can go with the 4 x 4 (which is still a thrill, but you don't need to drive) and every one meet at the top for lunch. The mountain trail is very bumpy and you need to be skilled to do it. This is for the adventurous ones. The full mountain trail takes 6-7 hrs and you rise over 500 m in altitude.